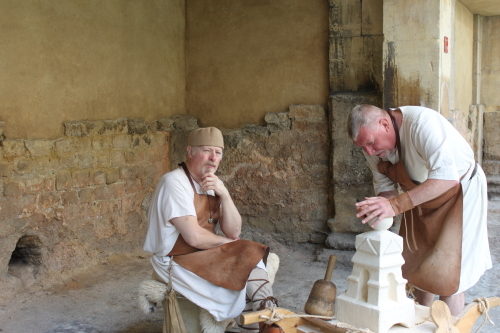 When I visited the Roman Baths, in Bath, I met two helpful and very knowledgeable ‘Roman’ stonemasons Brucetus and Veracundus and from them I gleaned the following information. The invading Romans arrived in the area in the 1st Century and stayed to the early part of the 5th Century. The native Celts had already discovered the hot spring that daily gushes up one million litres of water heated to 46°C. The hot spring fascinated the Romans and they believed it was the work of the Gods. 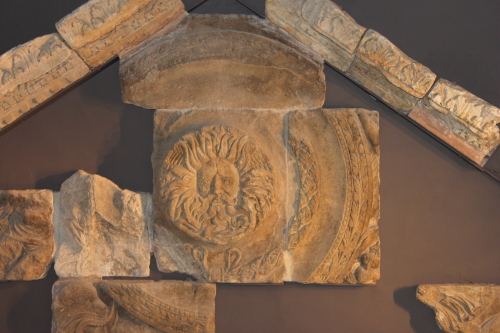 Initial hostilities between the two races evaporated when the Romans built the baths and a temple for worship of a deity named Sulis Minerva (a unification of the Celtic goddess Sulis and the Roman one Minerva). The Romans may not have found gold in the hills encircling Bath but they did find stone (00litic limestone) with which to build the baths plus the temple and lead which allowed them to lay the pipe work that channelled the hot water from the spring into a series of baths and the overflow into the river Avon. The stone is apparently very easy to work with and the fine dust that is created when it’s chiselled was used as a face powder by Roman women. The settlement became famous, an ‘It Spa’ of its day, possibly because of the reputed curative powers of the spring’s water and attracted many visitors from other parts of the Roman Empire. Limestone is still mined in the Bath hills which are now honeycombed with tunnels; these tunnels came into their own during the World War Two when they were used to store art treasures and as an underground space where aircraft parts could be made without fear of the ‘factory’ being bombed. 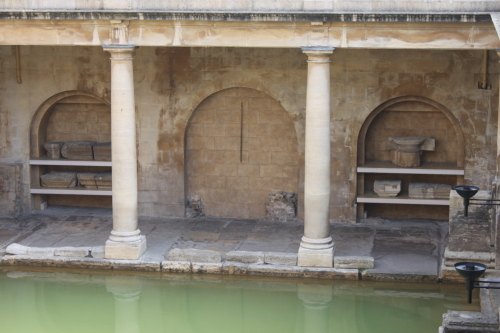 The Roman Baths are splendid and so worth a visit if you are in or near Bath, the cost of admission (£12.50) includes an audio guide and some of the commentary on this guide is by Bill Bryson. To Brucetus and Veracundus if you ever get to read this, gratias vobis ago, which I hope means thank you in Latin. I loved my visit to Bath a couple of years ago. I think I need to go back. Thanks for the great reminder. Hello and thanks for your comment. Yes Bath is amazing but Bagni Di Lucca looks beautiful too. Bath was by far my favorite city in England. I loved it and I always wish I could go back. Hi Vanessa, Bath is indeed very beautiful and I hope that you do get back there some day.